That's so strange, I was able to create one. Maybe since I created my Nest account a week ago. Contact HE support and they'll get this sorted for you. I do have support ticket open for this will report back with any advice they can offer. @bobbyD - What is the status of nest re: allowing more people to access it - I still get the error when I try to sign in. Is this something that nest is going to fix .. or once we reach the limit thats it forever? Unfortunately as @p.alto mentioned above, Google has suspended all reviews for undisclosed period of time. However, if you send us an email to support@hubitat.com we may be able to help you link your Nest devices. Where can I find this basic app? 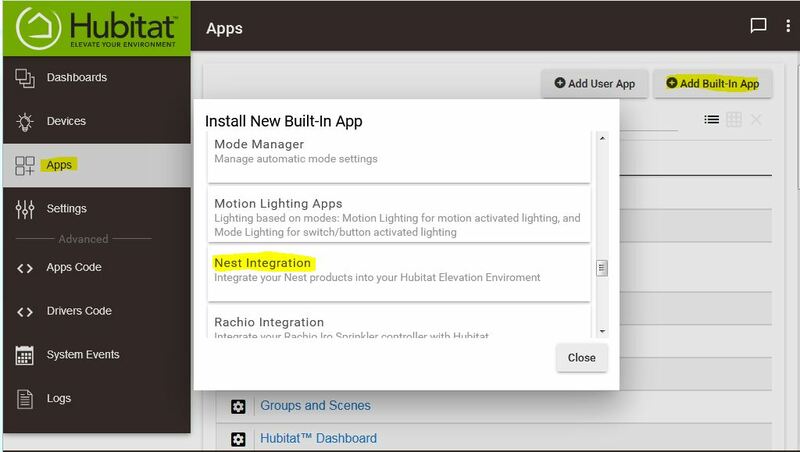 On the HE hub, click Apps in the navigation pane, then click the "Add Built-in App" button and select "Nest Integration" from the drop down list"
I have tried that a few times. It doesn’t work. From what I gather from reading the forums, that API doesn’t work because Hubitat has reached the cap of the amount of users currently allotted by Nest. However, I read a comment in this thread where someone had developed a ‘Basic app’. That was the API I was inquiring about. Contact HE support. They'll provide a work around that should get this resolved for you. I was able to generate some nest tokens when I created Nest manager (with ST), not sure if that helps at all? I think the issue with the tokens is the oauth redirect has to point to "https://cloud.hubitat.com/api/nest" instead of the Smartthings one. If you already have a developers account and are using that token then the instructions on how to do this are listed in one of the posts above..
Do the new hubs not have the Nest integration option? I just got mine the other day and it's up to date, but Nest isn't an option in the built-in apps. They removed it as an option (on both hubs) because Google/Nest has been delaying allowing access to the data via a 3rd party like HE for a while now. HE says they will put it back once Nest starts the program back up. I believe @tonesto7 was collaborating with someone to port over his awesome NST-Manager from ST. Not sure where that stands right now. The issue there (and like for HE's version) is you need to have a Nest developer account and creating new accounts has ALSO been placed on hold by Nest/Google it seems. I had backup up the configuration from my C4 hub, which already had Nest integration running. I have a C5 on order, is it possible to restore that config file to C5 and continue to use Nest on the C5? That is a question for the HE staff.. I dunno but assume a backup would backup your installed apps as well. Hi there, you can restore a back up from a c-4 hub to a c-5, as long as you use the USB stick. If you'd like to use the internal radios that come with c-5, you can still restore the main database (devices, apps, settings) but you will need to pair every device again. I know this is a touchy subject but I was one of the few that was able to get in on the official integration. I added a nest protect, went through the nest app in hubitat and added the protect but there is no device or anything new. Should there be? I was hoping to us it for motion, presence, maybe a temp sensor but I am not sure whats exposed. I think work on "official" integration is on hold for now (maybe forever) thanks to Google/Nest. No point in spending limited resources on something the majority of HE users can't access. I can't really speak for the folks at HE though. If you already have a Nest Dev account you can use NST Manager link above, if not I think you might be out of luck..
You don't even need a nest developer account for NST manager currently although I have one I'm not using it.